The speculation about when Martha Stewart's new book on entertaining will be released is over! The large, hardcover companion piece to Martha's first book, Entertaining, has been mentioned numerous times by Martha over the last three years. At last, on November 1, we will be able to page through this book ourselves! 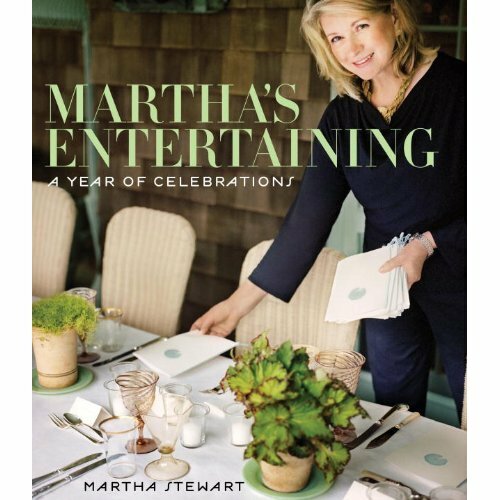 Called Martha's Entertaining: A Year of Celebrations, the 432-page book is now available for pre-order at Amazon.com. Based on what Martha has shared with us on her blog and in various interviews over the years, we know that the book will feature parties and gatherings (large and small) at her homes in Bedford, Maine and Long Island. Many of the photographs in the book will be by Frederic Lagrange. It's going to be an amazing tome, one that must be added tothe collection of any Martha Stewart fan. Also of interest: There is a series of new Martha Stewart 2012 calendars (wall calendars, engagement calendars and postcard calendars) that will be released in August. With photographic themes like cupcakes, cookies, crafts and gardens, these are ones for us collectors to watch for! FINALLY! Great news! I've been waiting for word on this particular release! I do hope it's a coffee table style book like the first Entertaining. Just in time for Christmas! I can't wait. There has been so much talk about it - I hope the hype lives up to expectation (I'm sure it will). Hello Andrew, I wish you the most romantic day today!